The man behind Carl E. Balita Review Center (CBRC) hinted possible release date of June 2013 nursing board exam or NLE results. 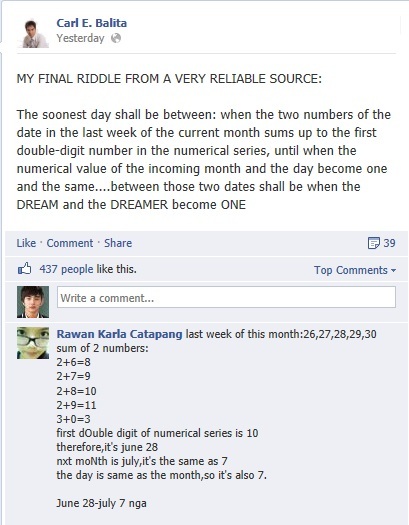 The Facebook riddles of Balita started last June 13, 2013 with the hints say that results will be out between June 28 and July 7, 2013. Carl Balita, one of the multi-awarded entrepreneur, best-selling author and a CBRC Reviewer is a reliable source for the exact release date of NLE results for the past nursing board exams. Balita hinted release date of June-July 2012 NLE and said results will be available by August 23. On that specified day, results have been released by PRC. Here is the logs of Carl Balita's Riddles on Facebook courtesy of PRCBoardNews.com.
" When tomorrow doubles its numerical value, the sun will rise thereafter as a new day that the Lord has made for the privileged dreamers to be one with their noble dreams to care. Pray harder and believe more, eagles...i mean, RNs. Sweet dreams..."
After tomorrow, I should be able to count with my fingers the dawning of the eagles hatched to soar with the privilege suffixed upon thy baptismal blessings..."
The soonest day shall be between: when the two numbers of the date in the last week of the current month sums up to the first double-digit number in the numerical series, until when the numerical value of the incoming month and the day become one and the same....between those two dates shall be when the DREAM and the DREAMER become ONE." Many expect that June 2013 NLE results will be out between June 28 and July Week1. What is your guess on his last riddle? If Carl Balita is correct, it means that the long wait is over. New RNs will be named. "There was a season that NLE result was delayed by one week because of typhoon that suspended work at PRC for a week. Hope it will not happen again to prolong the agony. ", Balita commented on his Facebook account. There is a total of 38,656 takers of June 2013 nursing board exam, lower than the previous NLEs. So, announcement of results less than the usual 30-45 days is possible. To receive more updates about June 2013 NLE, Follow Us on Twitter or Like Us on Facebook. Visit also prcboardnews.com for detailed updates.